This interview originally appeared in Issue Eight (Spring, 2015) of The Drummer's Journal. Click here to open. “Well whatever, but just wait until you meet the owner. He might actually be a wizard.” And with that, a bit like a character from such stories, this person I’d known for all of 120 seconds upped and left. I’d never heard anyone compare a drum shop to a fantastical alternate reality before, but it certainly served to ignite my curiosity. So a few weeks later, I boarded a train heading to Sunderland to visit what is reportedly the smallest drum shop in the world. 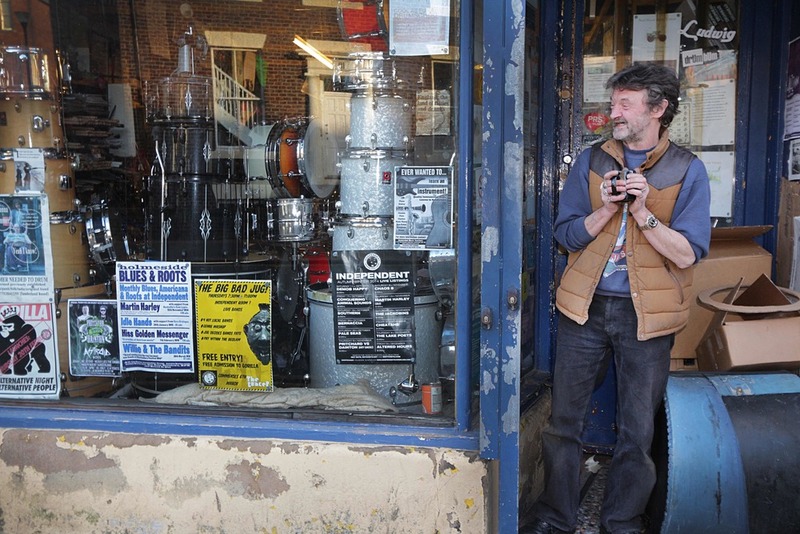 Sunderland Music, or as it’s known locally, Willie’s Drum Shop, is on a small street near the city centre, nestled in between a guitar shop and a Chinese takeaway. There’s no sign above the door, and the only window is plastered with posters for local gigs which serve nicely to obscure the shop’s contents. The blue paint has started to peel off the shutters and from around the window. If drum shops were ever made illegal and had to operate like a speakeasy, I like to think this is exactly what they’d look like. I learnt three things from my visit, all of which suddenly made me sympathise with the strange person I’d sat beside on the bus some weeks ago. First, the shop is indeed tiny. It is actually difficult to move without the risk of knocking something over. Drums, cymbals, pedals and all sorts of hardware are just piled up on all sides. 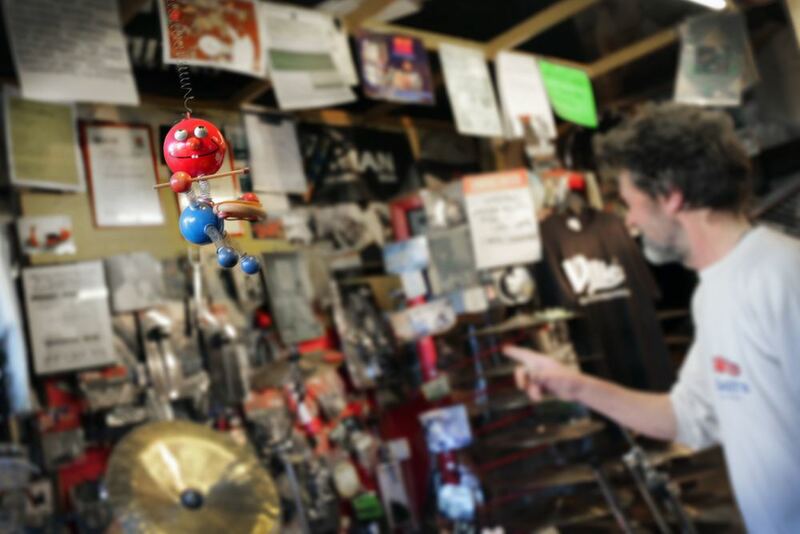 Second, Will, the owner, is one of the nicest people you’ll ever meet and has an almost supernatural ability to recall any fact about any drum set ever made. Lastly, once you’re inside, time does seem to stand still and you could lose days sifting through the hoard of trinkets and vintage gear. If at some point a talking lion did pop up, it’d actually be pretty unremarkable by comparison. Will Wright: Well, have you heard from whoever told you about it recently? They still could be in here somewhere, buried! I think they are probably ok. Thanks for the concern though. No problem. I mean, space is at a premium in here. It’s like New York! Just piles of drum kits stacked up like skyscrapers! So you’ve had a busy week? Well, for this time of year it hasn’t been bad. I’ve lined two or three nice things up for the ‘morra – if everybody sticks to the plan, it should be a good day (chuckles). What are your actual opening hours then? You just seem to be here all the time! I’m here from 10am until 6pm everyday except Sunday. Anything and everything that my wife can think of! The week’s shopping, anything that needs doing round the house. To be honest I just like to sit down and recharge my batteries. It does get a bit hectic in here sometimes. I’ve been here, oh, 25 years now, and the old shop was just round the corner. I was there for seven years, so I’ve been doing it for, my God, (emits contemplative sigh) 32 years now. What made you want to start a shop? (Splutters) aye of course, man! I played in all the local pubs and clubs. There was a local community of drummers, and I’d always hear, “does anyone have so and so I can buy?” So I went in with the bass player from the band and started selling drums. He went his own way eventually (sighs, with what I thought was a slight hint of remorse). Did you fall out or something? What? No, no, I was talking to him about 20 minutes ago actually! He started his own big, successful PA company. I stuck with the drums and the shop. But we’re still in touch after 30 odd years! How would you describe the shop? It’s two small rooms basically. 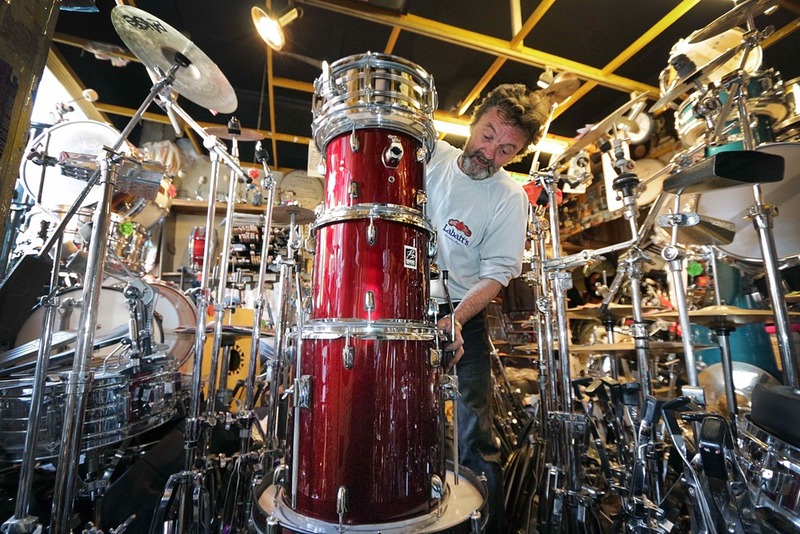 And it’s top to bottom full of stuff – drums, spares, everything; it’s an Aladdin’s cave really. It’s not a big, flashy shop with lights and men in suits. Well, of course we have lights! But just not the sort that flash on and off and that. And it’s just me here usually and I’m certainly not wearing a suit. We don’t have any of these £3000 kits on display either. Instead, I’ve got boxes and boxes full of nuts just from the 1950s alone, and pretty much every other decade. Pedals, snares, cymbals and cases by decade too, from the ‘50s right up until the modern ones. I do keep a tremendous amount of spares that’s true, bits and pieces, odd pieces of metal, and over the years I’ve got a bit of a reputation as pretty much having any spare part you might ever need. And even if I haven’t got it in, give me a couple of days and I’ll get it for you. People always say, “how do you even find anything in here?” It’s true that you can’t see the wood for the trees sometimes, but when you’ve been in your own shop for 25 years you know where everything is! Put it this way, I couldn’t afford to put any weight on because I wouldn’t be able to get into the back room otherwise! But within this shop, we’ve probably got 40 to 50 second hand kits too. The only thing I haven’t got is a set of congas, but I’ve a set coming in next week so there you go! What made you want to sell second hand and vintage gear as opposed to the shiny new stuff? I’d rather sell six £400 kits instead of waiting for one person to buy a £3000 kit. I mean,you’ll never get rich doing this, but as long as the fire is on and there’s something in the fridge, I’m happy. I’ve never been into big flashy things. I keep saying, the most important thing you can buy as a drummer will cost you about £1.99 and that’s your drum key. So many drummers are terrified to have a go at tuning drums. What fools people is just how simple it is. Just get a decent drum head, then tighten up the lugs until you get a sound you like. That’s it. Do the top, do the bottom. Take 30 minutes and just sit and play around with it. You’ll soon find what sounds you do and don’t like. There’s no wrong way to do it. Just get your drum key and go for it. Saying that, I had a customer in here recently who had a Remo Pinstripe on the bottom of a £600 snare drum and said it wouldn’t tune. I was thinking, “wait – this guy’s been playing about five or six years,” and he says, “I’m struggling to get a good sound out of this snare,” and I said, “you’ve a skin on that’s about ten times heavier than it needs!” So we put a snare skin on the bottom and it was perfect. How do people usually react when they come into your store for the first time? Is finding things ever a problem for people? (Laughs) I always ask people if they’re after anything specific because it’s far easier for me to find it than it’ll be for the customer! And a lot of people are just like, “can I just look around for half an hour?” so I’ll just have a cup of coffee and let them get on with it. There is so much stuff in here, and even sometimes I think that, “wow, it’s getting quite full.” But what I usually get is people saying, “wow, this is like the drums shops of old.” Especially the older drummers, the younger ones just seem fascinated. We’ve not lost a customer yet! Seaham, actually. It’s about five miles south of here, but I moved to Sunderland 40 years ago, so I suppose I’m a townie now! How would you describe Sunderland? It used to be heavily industrial. At one time, Sunderland had one of the biggest shipbuilding yards in the country. Most of that’s gone now, as have the coal pits. Nowadays it’s mostly known because of the huge Nissan factory. There’s quite a big student population too, but like a lot of northern cities, a lot of the shops are derelict. How about the music scene? Nightlife-wise, there’re plenty of gigs, but the one thing we do lack is a decent sized place for people to play. So we’ve pubs that’ll take about 200 people and then the Stadium of Light which takes about 40,000. So you can see the problem there (laughs). We’ve a theatre which would be perfect but they haven’t allowed any bands back there since the bloody Boom Town Rats tore out the first three rows back in the ‘80s. Have you ever sold anything with a nice story attached to it? Can you remember what he bought? He bought some Vic Firths. Can you remember what everyone buys? Well, I do have a good memory for that sort of thing, yes. How has the internet affected the shop? Have you heard of Black Friday? Oh have I! There’s been hell on over here! The police have been called to some shops! Some poor woman had her arm broken by someone as she was trying to get hold of a TV. Just madness (sighs with disbelief). Is it something you’d ever consider for the shop? Black Friday at Will’s Drum Shop? Well we can only fit about four people in at once so I don’t know how well it’d go down (laughs). And if people started fighting in ‘ere... I hate to think what’d happen with all this gear everywhere. You could hire some security. Keep the crowds in check. Oh heavens no, if we had a big guy at the door then no one would get in! Do you have any advice for people in retail? Do a good deal. Don’t rip people off! And then they’ll come back. You need to have a reputation to think of. Recently, I part exchanged a ride cymbal from a customer who had bought it from me 23 years ago, so after all those years I had this cymbal back in the shop. I thought that was great. Plus I could remember selling it to him the first time! Have you ever had any strange requests? I tell you what is odd, the stuff you find in bass drums. Unbelievable! You know people put things in bass drums to dampen the sound and that? Well, one time I had a bass drum come in that came stuffed with pink flip flops, all still new and in their packaging. I’ve still got few pairs left actually. For a while we were giving a pair away with every drum kit sold (laughs). The other thing was breezeblocks! I mean, who is putting breezeblocks in their bass drum?! One time there was an expensive sleeping bag, which I actually managed to sell on to a friend of mine. So that wasn’t too bad. Is there anything you’ve regretted selling? Oh... the first year I was open we had this beautiful American Gretsch kit. Absolutely mint, 13”, 16”, and 22” in bright white, die cast hoops and not a mark on it. We sold it for £200 (emits a painful sort of howling noise followed by laughter). I shudder to think what that’d be worth now. But the way I look at it, as long as it went out for more than it came in for, that’s fine with me. Probably when people ring in to say that they’re really happy with their purchase. That’s what it’s all about. I think someone said if you can find a job you’re happy with you’ll never work a day in your life. And I don’t consider this work. I’m here doing something I like. I meet old friends, new people and at the end of the day hopefully you can go home with some money in your pocket. But that’s what it’s about. Keep them happy, it keeps me happy. I’ll never be a millionaire, but as long as I can go home and there’s something to eat, then it’s been a good day. Say it again, still too quiet. Oh, a wizard? Well, I’ve certainly been called worse (laughs). Sometimes people will come in and say, “I don’t suppose you’ve got one of these?” and I’ll put my arm in the desk and pull it out, and the look on their face is like, “how did you know that was there?” And I just know. Being here for 25 years has a lot to do with that, mind. And I imagine most people have some sort of room or garage where the worst thing someone could ever do is come in and tidy it up. But nowadays the word is “legend” isn’t it? I do get called a legend by people quite a bit. I’m not really sure what that means. I mean, I think Buddy Rich is a legend, but certainly not me. Oh, hang on, I can just see someone coming across the road with a cymbal so I think they’re coming here. I’ll let you go then. It’s been great talking to you, Will... I think you’re a legend. Remember that if you’re ever in the North East the kettle’s on! You can subscribe to The Drummer's Journal - a free, independent online magazine - and have each new issue delivered straight to your inbox as soon as it's released (once every three months). Nothing more, nothing less.